The internet has become one of the most important tools for nearly every human on the planet. It has become a preferred method of communication, research, education, business and entertainment. On top of this, there is a list of mediums for which the internet is necessary: cell phones, tablets, and computers. Two bandwidth allocations determine how many megabytes (Mbps) determine the speed of incoming and outgoing data, and how fast this data will download and upload. The faster your internet or bandwidth, the quicker the data is sent or received. A typical web page uses 6.3 Mb per second to upload or download a certain number of bits of data. This is fast enough for the average individual to send an email, watch a video, listen to music; however, in the technological world and around the globe, 6.3 Mbps is considered relatively slow. Are there certain countries with faster internet in the world ? How do these countries derive such speeds, and for what purposes? 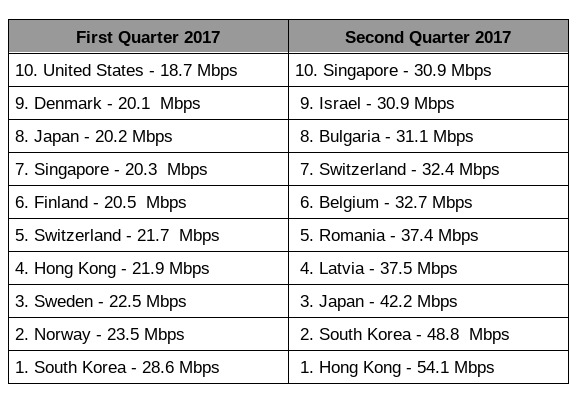 Every quarter, a company in Massachusetts releases the Akamai Report, which reports on countries with the fastest speeds. If you compare quarters, the list frequently fluctuates. Why the race for the fastest speed? Here is the list for the fastest 10 countries, as of June 2017, compared to the first quarter. What caused the changes? Pretty soon the third quarter results will be in, and analysts will want to know the reasons for the new changes. For the past 2-3 years, every quarter has been dominated by Asia or the Netherlands, so one would want to do some market researching there. Let's begin with the first quarter results for 2017, in descending order. Looking at these huge figure jumps in Mbps within just one quarter, we have to know "what's the rush?" What's the push behind the large fluctuation in numbers, and jump from country to country? Money, the economy, population per capita, and the government seem to be the main driving forces. If you are a country with a large population and economy, the internet is a necessity for your success. If you are in a smaller, perhaps less economically successful and less populated company, the government does not put many restrictions on the internet, causing what population they have to use the internet as much as possible. Taking a look at the second quarter leaders supports this theory, along with other a few other reasons for a country’s success. Hong Kong, for example, is one of the sturdiest economic regions in the world. It has also been called 'the home of foreign investors'. Since this country has progressed as fast as it has with internet speed, it has also made successes in other fields, such as finance and technology. The mass population of this country has influenced the connections to its 54.1 megabits per second, and created the necessity of high speed internet. South Korea and Hong Kong bounce back and forth for the lead position, being both highly populated areas. Being in constant competition, South Korea's government has promoted programs and strategies to assist its country with the highest internet speed. Japan is also a country that is abundant, long lasting, and well known in the field of technology. Japan is additionally the leading consumer of mobile internet users in the world. With more than 100 million internet handlers and 5G services just being introduced in this country, it’s no wonder its speeds are so fast. Lativia, Romania, and Belgium are three small European countries with some of the fastest technological and internet speed advances in the past 3 to 5 years. Latvia roughly has 2.4 million users, Romania 6 million, and Belgium 8.6 million. These numbers are comparatively low to have such strong Mbps. The reason behind their strength is the lack of governmental policing on the internet. No restrictions are placed, and nothing is monitored; in fact, nothing happened to internet crimes that took place in Belgium, so the internet is a free-for-all. Switzerland has been called the richest country in the world, with its more liberal views on finances and banking. Therefore, it is no surprise that when it comes to internet speed, this country has the highest rates in Europe. Bulgaria is making a name for itself as having one of the cheapest labor rates and lowest duty rates in Europe. It is increasing its economy for both domestic and foreign investors, hence the need for high speed and accessible internet for its low-cost citizens. Israel’s inclusion on the list should be noted. Israel is one of the prevalent countries, mostly due to its literacy rate which is the highest in the world. This is an astounding country in tech development, being the 8th nation of the world with a substantial amount of nuclear weapons. When talking about internet speed, Israel has engaged the best in this area, and the rest of the world should start asking questions. In all areas, Singapore is deemed as the richest country in the world; therefore, this small, elegant and beautiful country has taken many of the best stations in many areas of life. Engineering, commerce, and trade is much advanced. There are more than 11.5 million internet connection subscribers, showing internet technology is easily accessible. In the second quarter of 2017, several countries fell off the list including the United States. We know the U.S does not lack the population, economy, or the government to push it, so one has to look at the countries whose numbers are dropping and ask why. It’s easy to understand the importance of the internet during this era; it is the one sure-fire way people can communicate with each other almost instantly. It is just about possible to get internet signal in any corner of the globe these days. We all recognize the internet as the main medium by which we communicate, and access over 50% of our daily lives. Every quarter, the numbers in almost every country increase as well. With this knowledge, and with the knowledge that money, people and governments are behind most things, including internet speeds, why are countries like the United States not at the top of the list, and small countries like Latvia on it sometimes consecutively? And why are we letting countries with the powers of mass destruction have more speed to use those weapons? The top ten countries with the fastest internet in the world need to know why they have that speed. Is your country on the list? Let us know in the comments below!